Our intention is clear, we love to support the openings, ah ha moments, those lucid creative natural expressions of grace & truth that connect us more deeply to our selves, our bodies, our hearts and our earthly missions. Dance is a door, that goes within… Conscious rituals of movement, experienced dancers, beginners, adults, children or seniors learn new tools of transformation at any stage. Our School of Dance sits on 1,600 mts formed of solid quartz crystal in Alto Paraiso, Goias, Brazil. One of the 10 wonders of Brazil, this fertile little psychedelic town is a nationally preserved biome. World renown for its abundant ecotourism springing over 250 waterfalls & an advanced natural healing from our crystals, offering alone profound spiritual cleansing, as well as a vibrant electic community. All measurements based on the synergistic principles of sacred geometry. One of the first things you will notice is the altar of our sacred space, a cosmic star above your head. A geometrical center piece & one of the keys to our alignment. Known as the Star of Isis, representing the divine feminine. The planet Venus, dances the shape of a 5 pointed star across the sky, this cosmic display takes 8 years to complete, when its complete the movement has created a perfect pattern of a star across the sky. This cosmic dance is our inspiration. Programs in creative movement establish strength and grace, improved flexibility & fluidity. Our dance instructors are professionally trained - some are certified in specific movement and dance styles, others have inventive skills, and all are enthusiastically ready to serve you. rhythms of life & creativity through self love & respect. 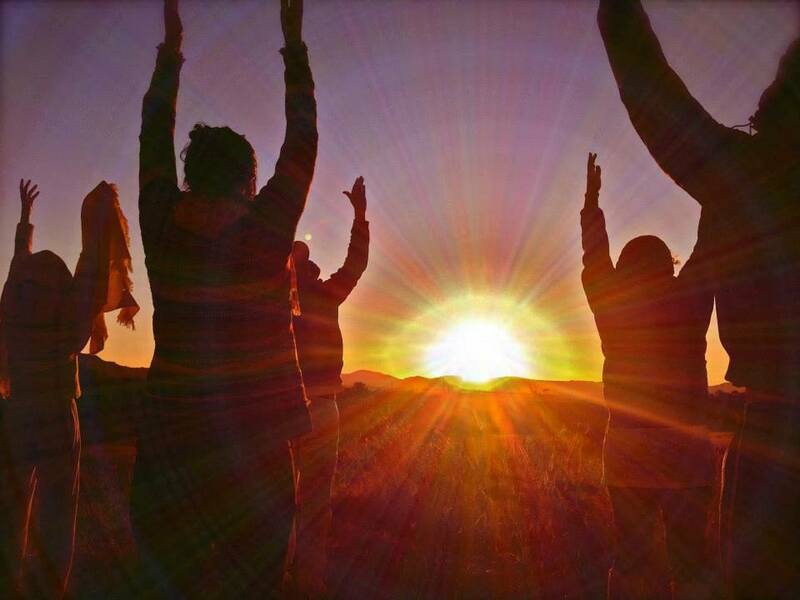 Our greatest Joy is sharing sacred space, breathing together, trance dancing in pure celebration. Life is a dance, and the sooner we experience the flow, the happier we will all be! One on one lessons are a great way to get individualized private instruction for therapeutic Dance, Yoga, Breathe ‘Pranayama’, Performance Training, and Visionary Life Planning. All aligned to be in tune with your current needs, overall wellbeing and uplifting. Often students have a goal in mind and other times a path is discovered as the work begins. Aerial Yoga is a powerful and fun way to hone your balance both internally and externally. As we strengthen our muscles and minds to be still in challenging postures, we become more mindful of our own ability to withstand peace and strength in any circumstance. Dance is a powerful tool to help women before entering the gateway of birth. It bridges the gap between the primal brain (which knows how to give birth) and the modern woman (who may need to be reminded of her instinctual capacity) assisting her to reclaim her most basic and inherent right as the Deliverer of Life, “Goddess”. Tantric love techniques, circle breathing, etc. are ancient tools of transformation, that all cradle the process of creation. Doula Dance beckons a woman to stand in the light of her truth and feel her conscious presence within her birthing body. Our work is to honor natural wisdom and dedicate ourselves to pursue the goal Orgasmic Birth. Our retreats are designed to explore the multidimensional aspects of natural trance states, the intuitive grace of mystical movement. Together remembering and awakening the inherent beauty of dance as a healing modality. Participants learn to channel their own authentic ritualistic dance and yogic practice. Together we create magical images which will become golden memories to remain treasured far into the future as family heirlooms. Original handmade costuming inspired by the unique personality and archetype of our mother to be. Whole families are also welcome to preserve forever this enchanted blooming of new life!